It's time to revisit code signing and antivirus detection! Two years ago I looked into whether or not Authenticode signatures (Microsoft object code signing for PE files) influenced the decisions of antivirus engines. In the first part I described the process of finding, signing and testing some malware with VirusTotal and it appeared that adding an Authenticode signature to a known piece of malware drastically lowered its detection rate. After an astute observation in the comments and some thinking about it, I decided this was more likely due to the fragility of the signatures created by antivirus vendors. In the second part I test this theory by using the VirusTotal API to test 100 malware samples to compare the response of adding an Authenticode signature to changing the binary in other ways. The result largely confirmed that rather than code signing that was defeating the antivirus scans, it was that the binary was changing at all. These results were ultimately unsatisfying, partly because of the surprising fragility of the antivirus signatures but also because of the test methodology. VirusTotal is a wonderful resource but is only testing the core antivirus engine of these security products which these days is only a small part of the protective services provided by security software. Additionally, the certificate that the malware was signed with was not endorsed by any certificate authority and was not deemed trusted by the operating system. This time around I investigated how the actual security products responded, and used a trusted certificated to sign the malware. Unlike last time, the number of engines tested is much lower and the number of samples used is only one. Turns out that this kind of testing is very time intensive if you don't already have the infrastructure set up. While I did have some free time during the US Government shutdown while waiting for a US visa, there's a limit to how many virtual machines I felt like setting up. This time the malware sample used is VPN-Pro.exe (MD5: 8eda7dfa4ec4ac975bb12d2a3186bbeb) as contributed by the redoubtable @headhntr to the Syrian Malware Samples Project. As described by the Citizenlab analysis it is a trojanized version of Freegate 7.35 written using .NET 3.5 that drops the ShadowTech RAT. The campaign was targeted at dissidents in Syria, make sure that you check out the analysis, it's fascinating but a little outside the scope of this post. When Citizenlab submitted VPN-Pro.exe to VirusTotal in June 2013 it was detected by 5/46 antivirus engines. When I checked in October the VirusTotal report had been updated to show detection by 34/47 antivirus engines. The test environment is a series of Windows 8.1 Virtual Machines with the following security software suites installed. In addition Chrome was installed in each VM, and each sample was submitted to VirusTotal. Six versions of the sample were tested, the original and five transformed versions. VPN-Pro.exe with 1024 'A' characters appended to the end. VPN-Pro.exe with random bytes added to match the length of the signed version. VPN-Pro.exe as prepared in number 3 but with roughly 10% of the signature bytes replaced randomly. VPN-Pro.exe signed with a trusted code signing certificate from StartSSL.com (thanks to the anonymous benefactor that helped me with this part). Each VM had the trial version (as found on the vendor's website) of the security software installed. 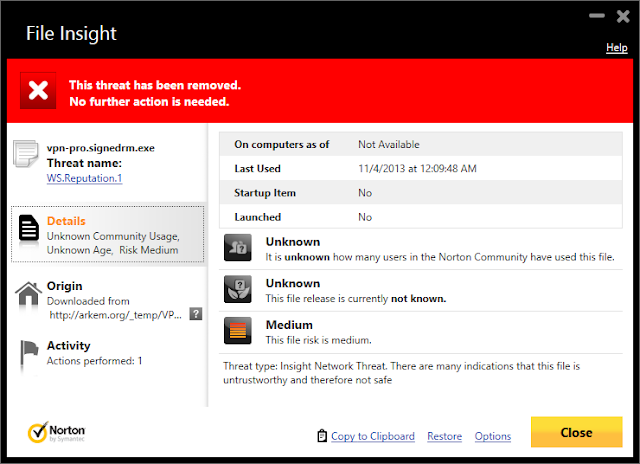 Windows and the security software were then updated. 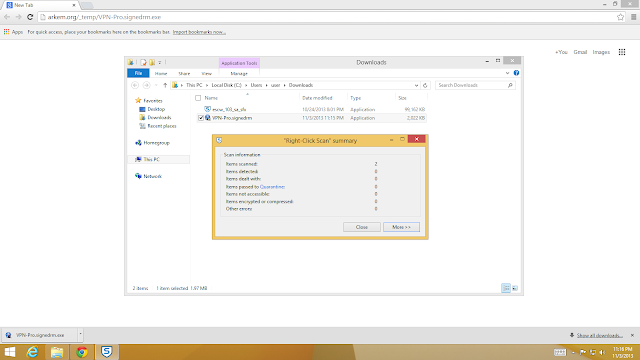 Next Chrome was used to download each sample and the reactions of the browser and security software were recorded. If there was no reaction from the security software or browser a manual scan was initiated where possible. In the case of Windows Defender the same tests were undertaken using Internet Explorer as well as Chrome. The original sample was detected as malware and automatically removed. 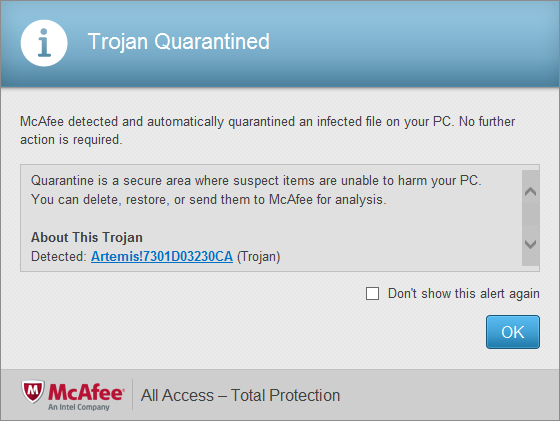 All other samples were detected as malware and quarantined. 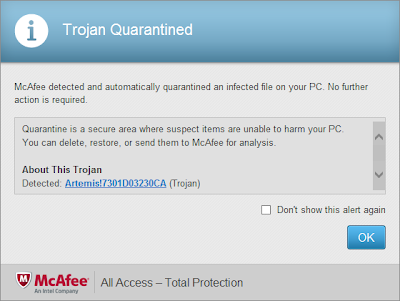 Considering that on the VirusTotal scan McAfee did not detect any of the transformed samples, my guess is that the Quarantined dialog is shown on heuristic or binary reputation based matches while the automated removal dialog is for signature based matches. The transformed samples were also all detected and automatically removed. The difference being that all the transformed files were detected as the threat "WS.Reputation.1" and the Threat Type of "Insight Network Threat". This suggests to me that the cloud binary reputation service is flagging these files as harmful largely because they have note been seen before. Again, the Symantec engine did not detect the transformed files during the VirusTotal submission (I assume that Norton 360 uses the Symantec antivirus engine). Again, the original sample was detected and removed. 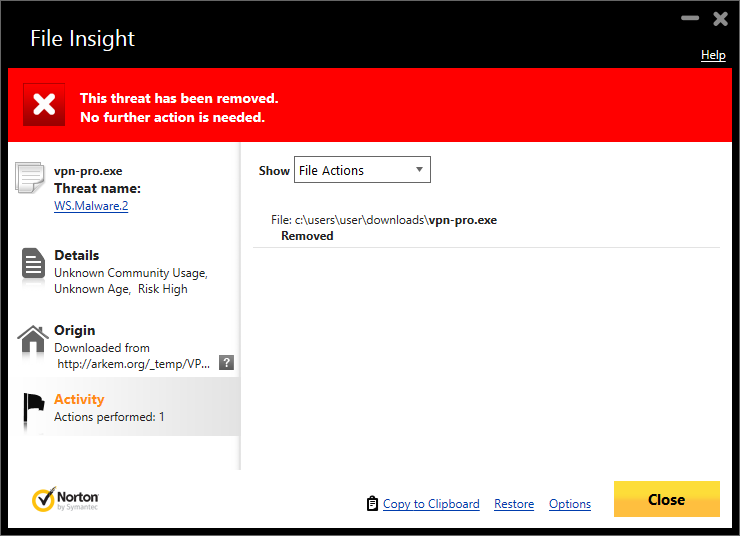 In fact all the transformations (except one) of VPN-Pro.exe were detected in the same way as the original and were tagged as Mal/Generic-S. The original was flagged as Mal/Generic-S on VirusTotal as well but the transformations weren't likewise flagged at the time, unsure whether this is due to some fuzzy matching or updated signatures. However, the Authenticode version with the trusted certificate was downloaded without complaint. Considering that the self signed version was flagged as malicious, I'm drawn to conclude that the validity of the signature was taken into account. A manual scan was run after the initial download completed. 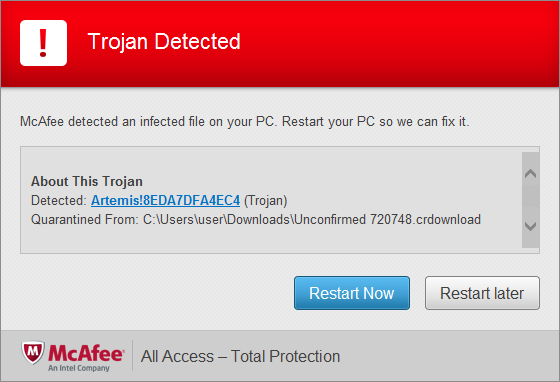 Like all the other security suites, the original was flagged as a virus and removed. What happens with the transformed versions is rather more interesting. Firstly the padded version was still detected as a virus, while the randomly padded one wasn't (the random padding was longer than the non-random padding). Unique to IE the damaged signature transformation was reported as a 'corrupt or invalid' signature and treated differently to the random padding transformation. The self-signed Authenticode transformation was flagged as "not commonly downloaded" rather than a virus, and the the trusted certificate Authenticode transformation was flagged the same way but with a yellow bar rather than a red one. The diversity of messages here was surprising, clearly the signature of the file is being examined and being combined with some cloud based binary reputation system (Smartscreen filter?) before a determination is given to the user. It's worth noting that a non-malicious, unsigned, uncommon binary gave the same message as the signed (untrusted) executable and that a non-malicious, unsigned, common binary (putty.exe) gave no warning message. This means that the malicious, signed binary landed somewhere in between these two cases. First a caveat: with only a single malware sample and a small handful of security suites we can not come to any sweeping conclusions. However, it looks like Windows Defender / Internet Explorer as well as Sophos take into account Authenticode signatures when scanning executables. All tested security suites seem to have very fragile signature driven engines that were defeated by almost any change to the sample but these systems are backed up by heuristic systems that are at least partially powered by a cloud based binary reputation mechanism. Windows Defender and Sophos both differentiated between untrusted Authenticode signatures and trusted signatures and Windows Defender differentiated between Authenticode signatures, a corrupted Authenticode signature, and arbitrary appended data. Hey everyone, just dropping in to tell you that I'm moving from Google to Riot Games. I've loved my time at Google but I'm really excited to be able to work on security in the context of online games (also I'm a huge fan of League of Legends). I'll still be blogging (possibly more so than before) and as always the views on this blog represent my opinions and not that of my employer. Stay tuned for a new blog post very soon now, I have some notes compiled that I just have to polish. Teams must develop a marketplace web application that allows people to organize bartering of academic goods or services in a school setting (e.g., selling used books, supplies, tutoring services). The Application should support a general marketplace where any Seller can post an Item they want to sell and any Buyer can express interest in or bid on an item. This Application does NOT include a payment transaction system; the Application connects potential Buyers with Sellers but does not perform actual payment transactions. If you're a student take a look! Google and Syscan are running a secure coding competition with sizable cash prizes. Teams of students will build web applications of App Engine that will be judged on their features and overall security.